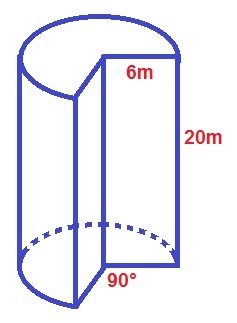 This figure is a right cylinder with radius of 2 m and a height of 10 m.
What is the surface area of the right cylinder (m2)? Find the surface area of a cylinder given that its radius is 2 and its height is 3.2. The base of a cylinder has an area of and the cylinder has a height of . 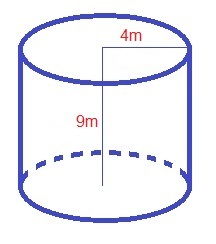 What is the surface area of this cylinder? Find the surface area of the following cylinder. 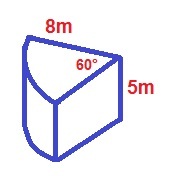 Find the surface area of the following partial cylinder. Where is the radius of the cylinder, is the height of the cylinder, and is the sector of the cylinder. What is the surface area of cylinder with a radius of 3 and height of 7? What is the volume of a cylinder with a radius of 2 and a length that is three times as long as its diameter? 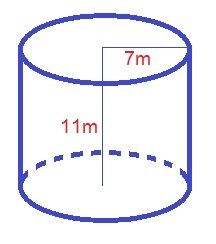 The volume of a cylinder is the base multiplied by the height or length. The base is the area of a circle, which is . Here, the radius is 2. The diameter is 4. Three times the diameter is 12. The height or length is 12. So, the answer is . A water glass has the shape of a right cylinder. The glass has an interior radius of 2 inches, and a height of 6 inches. The glass is 75% full. What is the volume of the water in the glass (in cubic inches)?